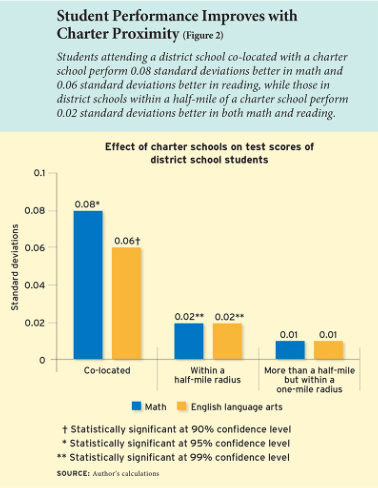 Students in public elementary schools score higher in tests of both reading and math when a charter school opens nearby, according to research summarized in the journal Education Next. The study of New York City schools concludes that the closer the district school is located to a charter alternative, the greater the positive impact on testing, attendance, and even school funding. Authored by Temple University academic Sarah Cordes, the study offers a new perspective on the question of how the swiftly growing number of charter schools (now enrolling more than 100,000 students in New York City alone) affects their traditional district counterparts. Many argue that charters in cities like New York deprive district schools of both funds and talented students. Particular ire is reserved for the practice of establishing a new charter within an existing district building, known as co-location. As charter networks like Success Academy press to expand in one of the world’s most expensive real estate markets, they often petition for classroom space at struggling and under-enrolled schools like those in Mayor de Blasio’s Renewal program — leaving many parents and school leaders to cry foul. But Cordes’s findings indicate that co-location actually lifts student performance in a variety of ways. Using city data gathered between 1996 and 2010 for more than 875,000 students, she measured standardized test scores, attendance, and grade retention in 584 district elementary schools around the city after a charter opened anywhere within a mile radius. Results improved as the proximity between charter and district school increased, with the greatest benefits found in schools that operated under the same roof. 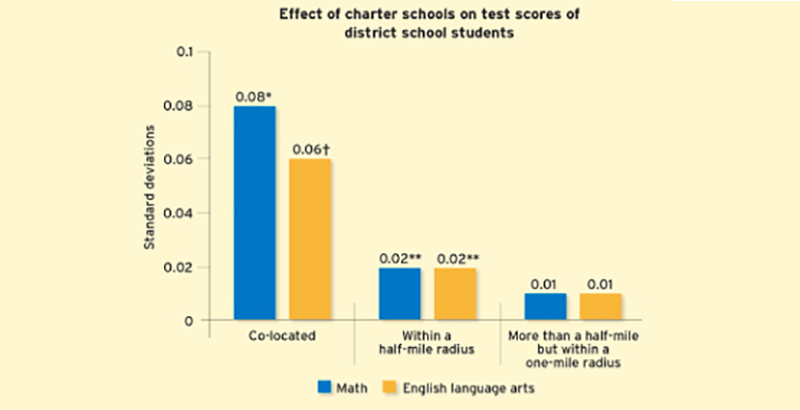 On standardized testing, scores for both math and reading were not meaningfully enhanced when a charter school was established between a half-mile and a mile away from an existing district school. But greater growth was detected when that distance was lowered to less than a half-mile, and it was more substantial still when both schools were co-located. Grade retention rates (the frequency with which students are held back) at schools close to charters were substantially reduced as well. In a district school located a half-mile to a mile away from a charter school, students were 20 percent less likely to be held back a grade. In co-located schools, district students were a remarkable 40 percent less likely to be held back. Cordes additionally finds that the upsides of charter proximity increase as charter saturation grows. These effects are achieved without altering the student composition of district incumbents. Though charters are sometimes accused of fostering greater racial segregation, and even “cream-skimming” the most academically promising pupils from surrounding schools, Cordes’s demographic analysis shows no sign of significant change following charter entry. Low-income students (as measured by their eligibility for free lunch) and black students make up slightly smaller proportions of the enrollment in district schools after a charter competitor opens nearby, while Hispanic students and those with special needs are somewhat more represented. Most surprising of all — and contrary to a common assumption that charters tend to deplete the coffers of the district schools they compete against — instructional spending actually increased at district schools once a charter opened nearby. Again, the effects were most acute in co-located schools, where spending jumps nearly 9 percent. But even when the new charter is founded a mile away, spending at the district school still rises by 2 percent.